Plastic, polymeric material that has the capability of being molded or shaped, usually by the application of heat and pressure. This property of plasticity, often found in combination with other special properties such as low density, low electrical conductivity, transparency, and toughness, allows plastics to be made into a great variety of products. These include tough and lightweight beverage bottles made of polyethylene terephthalate (PET), flexible garden hoses made of polyvinyl chloride(PVC), insulating food containers made of foamed polystyrene, and shatterproof windows made of polymethyl methacrylate. In this article a brief review of the essential properties of plastics is provided, followed by a more detailed description of their processing into useful products and subsequent recycling. For a fuller understanding of the materials from which plastics are made, see chemistry of industrial polymers. Many of the chemical names of the polymers employed as plastics have become familiar to consumers, although some are better known by their abbreviations or trade names. Thus, polyethylene terephthalate and polyvinyl chloride are commonly referred to as PET and PVC, while foamed polystyrene and polymethyl methacrylate are known by their trademarked names, Styrofoam and Plexiglas (or Perspex). Industrial fabricators of plastic products tend to think of plastics as either “commodity” resins or “specialty” resins. (The term resin dates from the early years of the plastics industry; it originally referred to naturally occurring amorphous solids such as shellac and rosin.) Commodity resins are plastics that are produced at high volume and low cost for the most common disposable items and durable goods. They are represented chiefly by polyethylene, polypropylene, polyvinyl chloride, and polystyrene. Specialty resins are plastics whose properties are tailored to specific applications and that are produced at low volume and higher cost. Among this group are the so-called engineering plastics, or engineering resins, which are plastics that can compete with die-cast metals in plumbing, hardware, and automotive applications. Important engineering plastics, less familiar to consumers than the commodity plastics listed above, are polyacetal, polyamide (particularly those known by the trade name nylon), polytetrafluoroethylene (trademark Teflon), polycarbonate, polyphenylene sulfide, epoxy, and polyetheretherketone. Another member of the specialty resins is thermoplastic elastomers, polymers that have the elastic properties of rubber yet can be molded repeatedly upon heating. Thermoplastic elastomers are described in the article elastomer. The distinction between carbon-chain and heterochain polymers is reflected in the table, in which selected properties and applications of the most important carbon-chain and heterochain plastics are shown and from which links are provided directly to entries that describe these materials in greater detail. It is important to note that for each polymer type listed in the table there can be many subtypes, since any of a dozen industrial producers of any polymer can offer 20 or 30 different variations for use in specific applications. For this reason the properties indicated in the table must be taken as approximations. *All values shown are for glass-fibre-reinforced samples (except for polyurethane). For the purposes of this article, plastics are primarily defined not on the basis of their chemical composition but on the basis of their engineering behaviour. More specifically, they are defined as either thermoplastic resins or thermosetting resins. Polymers are chemical compounds whose molecules are very large, often resembling long chains made up of a seemingly endless series of interconnected links. The size of these molecules, as is explained in chemistry of industrial polymers, is extraordinary, ranging in the thousands and even millions of atomic mass units (as opposed to the tens of atomic mass units commonly found in other chemical compounds). The size of the molecules, together with their physical state and the structures that they adopt, are the principal causes of the unique properties associated with plastics—including the ability to be molded and shaped. As mentioned above, polymers that are classified as plastics can be divided into two major categories: thermoplastics and thermosets. Thermoplastics such as polyethylene and polystyrene are capable of being molded and remolded repeatedly. Thus, a foamed-polystyrene cup can be heated and reshaped into a new form—for instance, a dish. The polymer structure associated with thermoplastics is that of individual molecules that are separate from one another and flow past one another. The molecules may have low or extremely high molecular weight, and they may be branched or linear in structure, but the essential feature is that of separability and consequent mobility. Thermosets, on the other hand, cannot be reprocessed upon reheating. During their initial processing, thermosetting resins undergo a chemical reaction that results in an infusible, insoluble network. Essentially, the entire heated, finished article becomes one large molecule. For example, the epoxy polymer used in making a fibre-reinforced laminate for a golf club undergoes a cross-linking reaction when it is molded at a high temperature. Subsequent application of heat does not soften the material to the point where it can be reworked and indeed may serve only to break it down. figureThe plastic behaviour of polymers is also influenced by their morphology, or arrangement of molecules on a large scale. Stated simply, polymer morphologies are either amorphous or crystalline. Amorphous molecules are arranged randomly and are intertwined, whereas crystalline molecules are arranged closely and in a discernible order. Most thermosets are amorphous, while thermoplastics may be amorphous or semicrystalline. Semicrystalline materials display crystalline regions, called crystallites, within an amorphous matrix. In addition, the relative crystallinities of the major plastics are indicated in the table of properties and applications. Amorphous and semicrystalline polymer morphologies. (Left) Volume-temperature diagram for amorphous and semicrystalline polymers, showing volume increasing with temperature. (Right) Schematic diagram of the semicrystalline morphology, showing amorphous regions and crystallites. Encyclopædia Britannica, Inc.
By definition, thermoplastic materials retain their molded shapes up to a certain temperature, which is set by the glass transition temperature or the melting temperature of the particular polymer. Below a certain temperature, known as the glass transition temperature (Tg), the molecules of a polymer material are frozen in what is known as the glassy state; there is little or no movement of molecules past one another, and the material is stiff and even brittle. Above Tg the amorphous parts of the polymer enter the rubbery state, in which the molecules display increased mobility and the material becomes plastic and even elastic (that is, able to be stretched). In the case of noncrystalline polymers such as polystyrene, raising the temperature further leads directly to the liquid state. On the other hand, for partly crystalline polymers such as low-density polyethylene or polyethylene terephthalate, the liquid state is not reached until the melting temperature (Tm) is passed. Beyond this point the crystalline regions are no longer stable, and the rubbery or liquid polymers can be molded or extruded. Thermosets, which do not melt upon reheating, can be dimensionally stable up to a temperature at which chemical degradation begins. The physical state and morphology of a polymer have a strong influence on its mechanical properties. A simple measure of the differences produced in mechanical behaviour is the elongation that occurs when a plastic is loaded (stressed) in tension. A glassy polymer such as polystyrene is quite stiff, showing a high ratio of initial stress to initial elongation. On the other hand, polyethylene and polypropylene, two highly crystalline plastics, are usable as films and molded objects because at room temperature their amorphous regions are well above their glass transition temperatures. The leathery toughness of these polymers above Tg results from the crystalline regions that exist in an amorphous, rubbery matrix. Elongations of 100 to 1,000 percent are possible with these plastics. In PET, another semicrystalline plastic, the crystalline portions exist in a glassy matrix because the Tg of PET is above room temperature. This gives the material a stiffness and high dimensional stability under stress that are of great importance in beverage bottles and recording tape. Almost all plastics exhibit some elongation on being stressed that is not recovered when the stress is removed. This behaviour, known as “creep,” may be very small for a plastic that is well below its Tg, but it can be significant for a partly crystalline plastic that is above Tg. The most commonly specified mechanical properties of polymers include stiffness and breaking stress, quantified in the table of properties and applications as flexural modulus and tensile strength. Another important property is toughness, which is the energy absorbed by a polymer before failure—often as the result of a sudden impact. Repeated applications of stress well below the tensile strength of a plastic may result in fatigue failure. Most plastics are poor conductors of heat; conductivity can be reduced even further by incorporating a gas (usually air) into the material. For instance, foamed polystyrene used in cups for hot beverages has a thermal conductivity about one-quarter that of the unfoamed polymer. Plastics also are electrical insulators unless especially designed for conductivity. Besides conductivity, important electrical properties include dielectric strength (resistance to breakdown at high voltages) and dielectric loss (a measure of the energy dissipated as heat when an alternating current is applied). In many plastic products, the polymer is only one constituent. In order to arrive at a set of properties appropriate to the product, the polymer is almost always combined with other ingredients, or additives, which are mixed in during processing and fabrication. Among these additives are plasticizers, colorants, reinforcements, and stabilizers. These are described in turn below. Plasticizers are used to change the Tg of a polymer. Polyvinyl chloride (PVC), for instance, is often mixed with nonvolatile liquids for this reason. Vinyl siding used on homes requires an unplasticized, rigid PVC with a Tg of 85 to 90 °C (185 to 195 °F). A PVC garden hose, on the other hand, should remain flexible even at 0 °C (32 °F). A mixture of 30 parts di(2-ethylhexyl) phthalate (also called dioctyl phthalate, or DOP) with 70 parts PVC will have a Tg of about −10 °C (15 °F), making it suitable for use as a garden hose. Although other polymers can be plasticized, PVC is unique in accepting and retaining plasticizers of widely varying chemical composition and molecular size. The plasticizer may also change the flammability, odour, biodegradability, and cost of the finished product. For most consumer applications, plastics are coloured. The ease with which colour is incorporated throughout a molded article is an advantage of plastics over metals and ceramics, which depend on coatings for colour. Popular pigments for colouring plastics include titanium dioxide and zinc oxide (white), carbon (black), and various other inorganic oxides such as iron and chromium. Organic compounds can be used to add colour either as pigments (insoluble) or as dyes (soluble). Reinforcements, as the name suggests, are used to enhance the mechanical properties of a plastic. Finely divided silica, carbon black, talc, mica, and calcium carbonate, as well as short fibres of a variety of materials, can be incorporated as particulate fillers. (The use of long or even continuous fibres as reinforcement, especially with thermosets, is described below in Fibre reinforcement.) Incorporating large amounts of particulate filler during the making of plastics such as polypropylene and polyethylene can increase their stiffness. The effect is less dramatic when temperature is below the polymer’s Tg. Because all carbon-based polymers are subject to oxidation, the most common stabilizers are antioxidants. Hindered phenols and tertiary amines are used in plastics in concentrations as low as a few parts per million. For example, butylated hydroxytoluene (BHT) is used in polyolefin packaging films for foods and pharmaceuticals. PVC requires the addition of heat stabilizers in order to reduce dehydrohalogenation (loss of hydrogen chloride [HCl]) at processing temperatures. Zinc and calcium soaps, organotin mercaptides, and organic phosphites are among the many additives found to be effective. Other stabilizers are designed specifically to reduce degradation by sunlight, ozone, and biological agents. The processing of raw materials into usable forms is termed fabrication or conversion. An example from the plastics industry would be the conversion of plastic pellets into films or the conversion of films into food containers. In this section the mixing, forming, finishing, and fibre reinforcing of plastics are described in turn. The first step in most plastic fabrication procedures is compounding, the mixing together of various raw materials in proportions according to a specific recipe. Most often the plastic resins are supplied to the fabricator as cylindrical pellets (several millimetres in diameter and length) or as flakes and powders. Other forms include viscous liquids, solutions, and suspensions. Mixing liquids with other ingredients may be done in conventional stirred tanks, but certain operations demand special machinery. Dry blending refers to the mixing of dry ingredients prior to further use, as in mixtures of pigments, stabilizers, or reinforcements. However, polyvinyl chloride(PVC) as a porous powder can be combined with a liquid plasticizer in an agitated trough called a ribbon blender or in a tumbling container. This process also is called dry blending, because the liquid penetrates the pores of the resin, and the final mixture, containing as much as 50 percent plasticizer, is still a free-flowing powder that appears to be dry. The workhorse mixer of the plastics and rubber industries is the internal mixer, in which heat and pressure are applied simultaneously. The Banbury mixer resembles a robust dough mixer in that two interrupted spiral rotors move in opposite directions at 30 to 40 rotations per minute. The shearing action is intense, and the power input can be as high as 1,200 kilowatts for a 250-kg (550-pound) batch of molten resin with finely divided pigment. In some cases, mixing may be integrated with the extrusion or molding step, as in twin-screw extruders. In extrusion, a melted polymer is forced through an orifice with a particular cross section (the die), and a continuous shape is formed with a constant cross section similar to that of the orifice. Although thermosets can be extruded and cross-linked by heating the extrudate, thermoplastics that are extruded and solidified by cooling are much more common. Among the products that can be produced by extrusion are film, sheet, tubing, pipes, insulation, and home siding. In each case the profile is determined by the die geometry, and solidification is by cooling. Longitudinal section of a screw extruder of thermoplastic polymers. Plastic pellets are fed from a hopper into the barrel of the extruder, where the pellets are gradually melted by mechanical energy generated by a turning screw and by heaters arranged along the barrel. The molten polymer is forced through a die, which shapes the extrudate into products such as the examples shown. Encyclopædia Britannica, Inc.
figureMost plastic grocery bags and similar items are made by the continuous extrusion of tubing. In blow extrusion, the tube is expanded before being cooled by being made to flow around a massive air bubble. Air is prevented from escaping from the bubble by collapsing the film on the other side of the bubble. For some applications, laminated structures may be made by extruding more than one material at the same time through the same die or through multiple dies. Multilayer films are useful since the outer layers may contribute strength and moisture resistance while an inner layer may control oxygen permeability—an important factor in food packaging. The layered films may be formed through blow extrusion, or extrudates from three machines may be pressed together in a die block to form a three-layer flat sheet that is subsequently cooled by contact with a chilled roll. Blow extrusion of thermoplastic polymers. 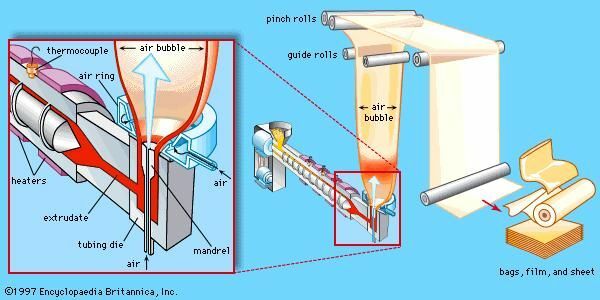 Molten extrudate is forced past a tubing mandrel, expanded into a balloon shape by a stream of air, drawn upward by rollers, and pinched into a collapsed sheet to be cut into a number of products. Encyclopædia Britannica, Inc. The flow through a die in extrusion always results in some orientation of the polymer molecules. Orientation may be increased by drawing—that is, pulling on the extrudate in the direction of polymer flow or in some other direction either before or after partial solidification. In the blow extrusion process, polymer molecules are oriented around the circumference of the bag as well as along its length, resulting in a biaxially oriented structure that often has superior mechanical properties over the unoriented material. In the simplest form of compression molding, a molding powder (or pellets, which are also sometimes called molding powder) is heated and at the same time compressed into a specific shape. In the case of a thermoset, the melting must be rapid, since a network starts to form immediately, and it is essential for the melt to fill the mold completely before solidification progresses to the point where flow stops. The highly cross-linked molded article can be removed without cooling the mold. Adding the next charge to the mold is facilitated by compressing the exact required amount of cold molding powder into a preformed “biscuit.” Also, the biscuit can be preheated by microwave energy to near the reaction temperature before it is placed in the mold cavity. A typical heater, superficially resembling a microwave oven, may apply as much as 10 kilovolts at a frequency of one megahertz. 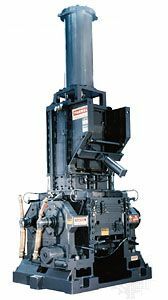 Commercial molding machines use high pressures and temperatures to shorten the cycle time for each molding. The molded article is pushed out of the cavity by the action of ejector pins, which operate automatically when the mold is opened. In some cases, pushing the resin into the mold before it has liquefied may cause undue stresses on other parts. For example, metal inserts to be molded into a plastic electrical connector may be bent out of position. This problem is solved by transfer molding, in which the resin is liquefied in one chamber and then transferred to the mold cavity. In one form of compression molding, a layer of reinforcing material may be laid down before the resin is introduced. The heat and pressure not only form the mass into the desired shape but also combine the reinforcement and resin into an intimately bound form. When flat plates are used as the mold, sheets of various materials can be molded together to form a laminated sheet. Ordinary plywood is an example of a thermoset-bound laminate. In plywood, layers of wood are both adhered to one another and impregnated by a thermoset such as urea-formaldehyde, which forms a network on heating. It is usually slow and inefficient to mold thermoplastics using the compression molding techniques described above. In particular, it is necessary to cool a thermoplastic part before removing it from the mold, and this requires that the mass of metal making up the mold also be cooled and then reheated for each part. Injection molding is a method of overcoming this inefficiency. Injection molding resembles transfer molding in that the liquefying of the resin and the regulating of its flow is carried out in a part of the apparatus that remains hot, while the shaping and cooling is carried out in a part that remains cool. In a reciprocating screw injection molding machine, material flows under gravity from the hopper onto a turning screw. The mechanical energy supplied by the screw, together with auxiliary heaters, converts the resin into a molten state. At the same time the screw retracts toward the hopper end. When a sufficient amount of resin is melted, the screw moves forward, acting as a ram and forcing the polymer melt through a gate into the cooled mold. Once the plastic has solidified in the mold, the mold is unclamped and opened, and the part is pushed from the mold by automatic ejector pins. The mold is then closed and clamped, and the screw turns and retracts again to repeat the cycle of liquefying a new increment of resin. For small parts, cycles can be as rapid as several injections per minute. Injection molding of thermoplastic polymers. (Left) Plastic pellets are fed from a hopper into a reciprocating screw injection molding machine, where they are melted by the mechanical energy exerted by a turning screw and by heaters arranged along the barrel. (Centre) The screw moves forward, injecting the molten plastic into a mold. (Right) After the plastic has solidified, the mold is opened and the molded piece ejected. Encyclopædia Britannica, Inc.
One type of network-forming thermoset, polyurethane, is molded into parts such as automobile bumpers and inside panels through a process known as reaction injection molding, or RIM. The two liquid precursors of a polyurethane are a multifunctional isocyanate and a prepolymer, a low-molecular-weight polyether or polyester bearing a multiplicity of reactive end-groups such as hydroxyl, amine, or amide. In the presence of a catalyst such as a tin soap, the two reactants rapidly form a network joined mainly by urethane groups. The reaction takes place so rapidly that the two precursors have to be combined in a special mixing head and immediately introduced into the mold. However, once in the mold, the product requires very little pressure to fill and conform to the mold—especially since a small amount of gas is evolved in the injection process, expanding the polymer volume and reducing resistance to flow. The low molding pressures allow relatively lightweight and inexpensive molds to be used, even when large items such as bumper assemblies or refrigerator doors are formed. The popularity of thermoplastic containers for products previously marketed in glass is due in no small part to the development of blow molding. In this technique, a thermoplastic hollow tube, the parison, is formed by injection molding or extrusion. In heated form, the tube is sealed at one end and then blown up like a balloon. The expansion is carried out in a split mold with a cold surface; as the thermoplastic encounters the surface, it cools and becomes dimensionally stable. The parison itself can be programmed as it is formed with varying wall thickness along its length, so that, when it is expanded in the mold, the final wall thickness will be controlled at corners and other critical locations. In the process of expansion both in diameter and length (stretch blow molding), the polymer is biaxially oriented, resulting in enhanced strength and, in the case of polyethylene terephthalate (PET) particularly, enhanced crystallinity. Blow molding of plastic containers. (Counterclockwise from top) A molten polymer is extruded into a hollow tube-shaped parison. 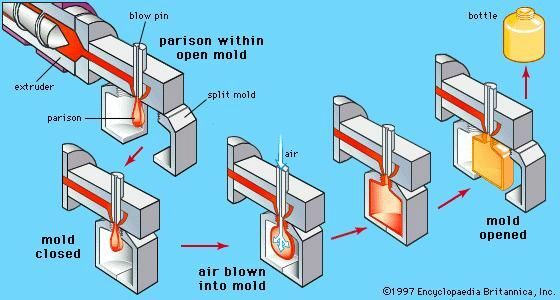 A split mold is closed around the parison, which is expanded against the sides of the mold by a stream of air. Once the plastic has solidified, the mold is opened and the shaped bottle released. Encyclopædia Britannica, Inc.
Blow molding has been employed to produce bottles of polyethylene, polypropylene, polystyrene, polycarbonate, PVC, and PET for domestic consumer products. It also has been used to produce fuel tanks for automobiles. In the case of a high-density-polyethylene tank, the blown article may be further treated with sulfur trioxide in order to improve the resistance to swelling or permeation by gasoline. Not every forming process requires high pressures. If the material to be molded is already a stable liquid, simply pouring (casting) the liquid into a mold may suffice. Since the mold need not be massive, even the cyclical heating and cooling for a thermoplastic is efficiently done. One example of a cast thermoplastic is a suspension of finely divided, low-porosity PVC particles in a plasticizer such as dioctyl phthalate (DOP). This suspension forms a free-flowing liquid (a plastisol) that is stable for months. However, if the suspension (for instance, 60 parts PVC and 40 parts plasticizer) is heated to 180 °C (356 °F) for five minutes, the PVC and plasticizer will form a homogeneous gel that will not separate into its components when cooled back to room temperature. A very realistic insect or fishing worm can be cast from a plastisol using inexpensive molds and a cycle requiring only minutes. In addition, when a mold in the shape of a hand is dipped into a plastisol and then removed, subsequent heating will produce a glove that can be stripped from the mold after cooling. Thermoset materials can also be cast. For example, a mixture of polymer and multifunctional monomers with initiators can be poured into a heated mold. When polymerization is complete, the article can be removed from the mold. A transparent lens can be formed in this way using a diallyl diglycol carbonate monomer and a free-radical initiator. In order to make a hollow article, a split mold can be partially filled with a plastisol or a finely divided polymer powder. 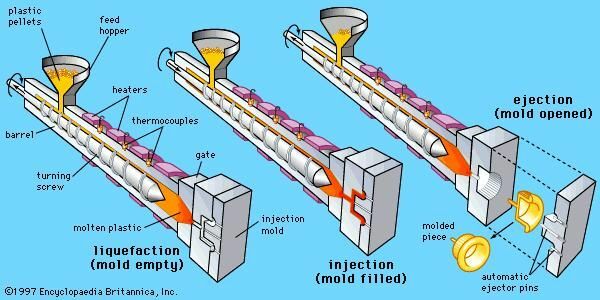 Rotation of the mold while heating converts the liquid or fuses the powder into a continuous film on the interior surface of the mold. When the mold is cooled and opened, the hollow part can be removed. Among the articles produced in this manner are many toys such as balls and dolls. When a sheet of thermoplastic is heated above its Tg or Tm, it may be capable of forming a free, flexible membrane as long as the molecular weight is high enough to support the stretching. In this heated state, the sheet can be pulled by vacuum into contact with the cold surface of a mold, where it cools to below Tg or Tm and becomes dimensionally stable in the shape of the mold. Cups for cold drinks are formed in this way from polystyrene or PET. Vacuum forming is only one variation of sheet thermoforming. The blow molding of bottles described above differs from thermoforming only in that a tube rather than a sheet is the starting form. Even without heating, some thermoplastics can be formed into new shapes by the application of sufficient pressure. This technique, called cold molding, has been used to make margarine cups and other refrigerated food containers from sheets of acrylonitrile-butadiene-styrene copolymer. Foams, also called expanded plastics, possess inherent features that make them suitable for certain applications. For instance, the thermal conductivity of a foam is lower than that of the solid polymer. Also, a foamed polymer is more rigid than the solid polymer for any given weight of the material. Finally, compressive stresses usually cause foams to collapse while absorbing much energy, an obvious advantage in protective packaging. Properties such as these can be tailored to fit various applications by the choice of polymer and by the manner of foam formation or fabrication. 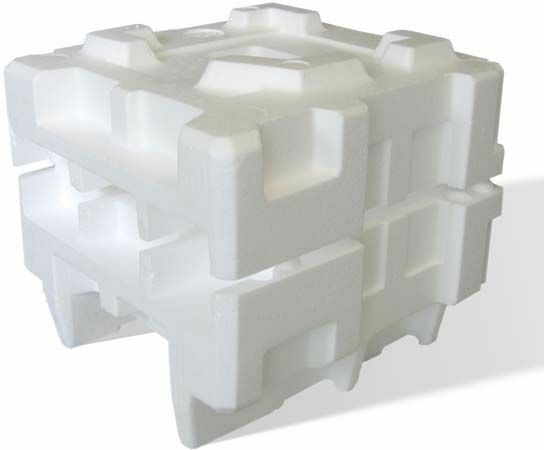 The largest markets for foamed plastics are in home insulation (polystyrene, polyurethane, phenol formaldehyde) and in packaging, including various disposable food and drink containers. Polystyrene pellets can be impregnated with isopentane at room temperature and modest pressure. When the pellets are heated, they can be made to fuse together at the same time that the isopentane evaporates, foaming the polystyrene and cooling the assembly at the same time. Usually the pellets are prefoamed to some extent before being put into a mold to form a cup or some form of rigid packaging. The isopentane-impregnated pellets may also be heated under pressure and extruded, in which case a continuous sheet of foamed polystyrene is obtained that can be shaped into packaging, dishes, or egg cartons while it is still warm. Structural foams can also be produced by injecting nitrogen or some other gas into a molten thermoplastic such as polystyrene or polypropylene under pressure in an extruder. Foams produced in this manner are more dense than the ones described above, but they have excellent strength and rigidity, making them suitable for furniture and other architectural uses. One way of making foams of a variety of thermoplastics is to incorporate a material that will decompose to generate a gas when heated. To be an effective blowing agent, the material should decompose at about the molding temperature of the plastic, decompose over a narrow temperature range, evolve a large volume of gas, and, of course, be safe to use. One commercial agent is azodicarbonamide, usually compounded with some other ingredients in order to modify the decomposition temperature and to aid in dispersion of the agent in the resin. One mole (116 grams) of azodicarbonamide generates about 39,000 cubic cm of nitrogen and other gases at 200 °C. Thus, 1 gram added to 100 grams of polyethylene can result in foam with a volume of more than 800 cubic cm. Polymers that can be foamed with blowing agents include polyethylene, polypropylene, polystyrene, polyamides, and plasticized PVC. The rapid reaction of isocyanates with hydroxyl-bearing prepolymers to make polyurethanes is mentioned above in Reaction injection molding. These materials also can be foamed by incorporating a volatile liquid, which evaporates under the heat of reaction and foams the reactive mixture to a high degree. The rigidity of the network depends on the components chosen, especially the prepolymer. Hydroxyl-terminated polyethers are often used to prepare flexible foams, which are used in furniture cushioning. Hydroxyl-terminated polyesters, on the other hand, are popular for making rigid foams such as those used in custom packaging of appliances. The good adhesion of polyurethanes to metallic surfaces has brought about some novel uses, such as filling and making rigid certain aircraft components (rudders and elevators, for example). Another rigid thermoset that can be foamed in place is based on phenol-formaldehyde resins. The final stage of network formation is brought about by addition of an acid catalyst in the presence of a volatile liquid. Some plastics can be joined by welding, in the same manner as metals—PVC and polyethylene tanks and ductwork being prime examples. More commonly, surfaces are joined by being brought into contact with one another and heated by conduction or by dielectric heating. Heat sealing of bags made from tubes of blow-extruded polyolefins such as polyethylene and polypropylene usually requires contact with a hot sealing bar. PVC has a high enough dielectric loss that heat can be generated throughout the material by exposure to a high-frequency, high-voltage electric field. Rigid thermoplastics and thermosets can be machined by conventional processes such as drilling, sawing, turning on a lathe, sanding, and other operations. Glass-reinforced thermosets are machined into gears, pulleys, and other shapes, especially when the number of parts does not justify construction of a metal mold. Various forms can be stamped out (die-cut) from sheets of thermoplastics and thermosets. The cups made by vacuum forming, for instance, are cut out of the mother sheet using a sharp die. In the case of a thermoplastic such as polystyrene, the scrap sheet left over can be reground and remolded. Although colour may be added in the form of a pigment or dye throughout a plastic article, there are many applications where a surface coating is valuable for protective or decorative purposes. The automobile bumpers produced by reaction injection molding can be painted to match the rest of the body. It is important in applying coatings to plastics that the solvent used does not cause swelling of the underlying substrate. For this reason, latex dispersion paints have found favour, although surface treatment is necessary to provide good bonding with these materials. The term polymer-matrix composite is applied to a number of plastic-based materials in which several phases are present. It is often used to describe systems in which a continuous phase (the matrix) is polymeric and another phase (the reinforcement) has at least one long dimension. The major classes of composites include those made up of discrete layers (sandwich laminates) and those reinforced by fibrous mats, woven cloth, or long, continuous filaments of glass or other materials. Plywood is a form of sandwich construction of natural wood fibres with plastics. The layers are easily distinguished and are both held together and impregnated with a thermosetting resin, usually urea formaldehyde. A decorative laminate can consist of a half-dozen layers of fibrous kraft paper (similar to paper used for grocery bags) together with a surface layer of paper with a printed design—the entire assembly being impregnated with a melamine-formaldehyde resin. For both plywood and the paper laminate, the cross-linking reaction is carried out with sheets of the material pressed and heated in large laminating presses. Fibrous reinforcement in popular usage is almost synonymous with fibreglass, although other fibrous materials (carbon, boron, metals, aramid polymers) are also used. Glass fibre is supplied as mats of randomly oriented microfibrils, as woven cloth, and as continuous or discontinuous filaments. Hand lay-up is a versatile method employed in the construction of large structures such as tanks, pools, and boat hulls. In hand lay-up mats of glass fibres are arranged over a mold and sprayed with a matrix-forming resin, such as a solution of unsaturated polyester (60 parts) in styrene monomer (40 parts) together with free-radical polymerization initiators. The mat can be supplied already impregnated with resin. Polymerization and network formation may require heating, although free-radical “redox” systems can initiate polymerization at room temperature. The molding may be compacted by covering the mold with a blanket and applying a vacuum between the blanket and the surface or, when the volume of production justifies it, by use of a matching metal mold. Continuous multifilament yarns consist of strands with several hundred filaments, each of which is 5 to 20 micrometres in diameter. These are incorporated into a plastic matrix through a process known as filament winding, in which resin-impregnated strands are wound around a form called a mandrel and then coated with the matrix resin. When the matrix resin is converted into a network, the strength in the hoop direction is very great (being essentially that of the glass fibres). Epoxies are most often used as matrix resins, because of their good adhesion to glass fibres, although water resistance may not be as good as with the unsaturated polyesters. A method for producing profiles (cross-sectional shapes) with continuous fibre reinforcement is pultrusion. As the name suggests, pultrusion resembles extrusion, except that the impregnated fibres are pulled through a die that defines the profile while being heated to form a dimensionally stable network.